Tortola islands boast ancient ruins, white sand beaches and a colourful harbor not to mention diverse landscapes and plenty of things to do once you disembark your cruise ship. Here are the top 10 things to do at Tortola cruise port and its surrounding areas. 1. One of the most popular of all the BVI attractions is the Virgin Gorda Baths. This area was created when a volcanic eruption brought giant boulders to the surface, making underwater caves and a beautiful geologic display. You can walk among the boulders, snorkel in the waters or just enjoy the views from the beach in this amazing natural place. 2. Sage Mountain National Park is the first national park in the BVI and not far from the Tortola cruise port. Sage Mountain is the highest point which offers panoramic views of the islands as well as lush vegetation along the 12 walking trails. 3. The 1780 Lower Estate Sugar Works allows visitors to tour the site of a sugar plantation that was also used as a cotton mill that was originally built by slaves. Today it is a museum and has monthly art exhibits as well. 4. A cruise to the Virgin Islands wouldn’t be complete without a trip to visit the dolphins in Dolphin Discovery. Swim with the dolphins, shake a fin and enjoy just being with these magical creatures. 5. The Callwood Rum Distillery offer tours of several original structures that were part of a large sugarcane distillery. Purchase rum, watch as the original boiler operates to produce rum and watch as they store the rum in the original casks. There is also an art gallery and gift shop on site. 6. Blue Sail tours offers snorkelling and sightseeing trips around the islands on two different boats that are custom built for this purpose. See the islands up close and from a different perspective from the crystal clear waters. 7. Eco-tours from Tortola cruise port are guided and can be snorkelling, hiking, bird watching, or sightseeing in nature. Plenty to see and do and educational in nature, these tours offer something for everyone. 8. Salt water fly fishing is the fastest growing sport in the world and the BVI are leaders in teaching visitors how it is done. Come and experience this for yourself as you fish for Bonefish, Permit and Tarpon, among others. 9. If you are looking for a calmer excursion from your Eastern Caribbean cruises, you will find it at the J.R. O’Neal Botanic Gardens. Here you can enjoy 4 acres of lush tropical plants, a pergola walk, a waterfall, birdhouses and a miniature rainforest as you take a leisurely walk around the grounds. 10. Mount Healthy National Park boasts remnants of a boiling house, animal mill, a distillery, hospital and housing on an estate once owned by the area’s wealthiest planner. Explore the history as you see what life was like years ago on a sugar plantation. 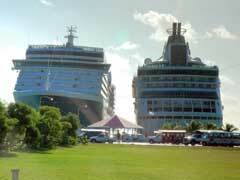 The Tortola cruise port is a charming gateway to all that the BVI has in store for cruise ship passengers. Make sure your Caribbean cruise deals offer the British Virgin Islands as a port of call on your next cruise.